Floods are a major cause of mold growth in residential homes. When there is a flood caused by a rainstorm or a massive snow thaw water enters the house through the roof, cracks in the foundation, or the sewer drain. Some people experience floods in their home due to a leaky or burst pipe or because of a sink/tub overflow. After a flood you need to dry your house and everything inside that got wet as fast as possible. You have about 24 – 36 hours to start the drying process and flood water cleanup before mold (also spelled “mould”) and bacteria begin to grow. If drying is not started quickly, having excessive water in your home will give mold a moist, damp environment to grow in. If your house has been flooded and you have noticed signs of moisture or water damage such as staining on the ceiling or walls, you most likely have mold growth in your home. You may have mold even if you cannot see it because mold often grows in areas that are not visible such as behind wall panels, between door casings, in ceiling tiles etc. If you notice a musty or moldy smell, chances are you have a mould problem. Stachyborys chartarum (black mold) is a mold that produces extremely toxic substances called mycotoxins. Black mold can be dark green or black in colour and it grows on materials with high cellulose content such as wood, drywall, insulation and wallpaper. 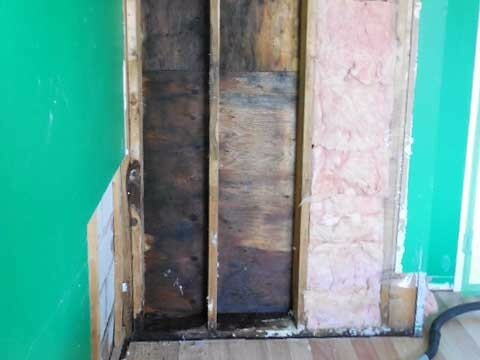 It is common to find black mold growing in houses with significant water damage caused by flooding because black mold flourishes in damp environments. The mycotoxins released by black mold can be extremely hazardous to one’s health. Floods are a major cause of mold growth. If your home has been flooded and you suspect you have mold, you should contact a mould professional. Alert Restoration specializes in mold removal and cleanup and we would be pleased to perform a mold inspection for you at no charge. If it turns out you have mold growing in your home Alert Restoration will provide you with a mold assessment, recommending a mould remediation strategy. Alert Restoration provides mold removal services to customers in Oakville, Mississauga and the surrounding areas. Call Alert Restoration. We’ll make sure the air you breathe is clean!